Under repair at Wallsend Dry Docks. Built Uddevallavarvet yard number 191. London & Overseas Freighters Ltd. Sold 1979 as "Agia Marina" and 1981 as "Olympiakos", then 1983 as "Skaros". Hit by Exocet in Bandar Khomenei Channel 31 Jan 1984. Abandoned as Total Loss. 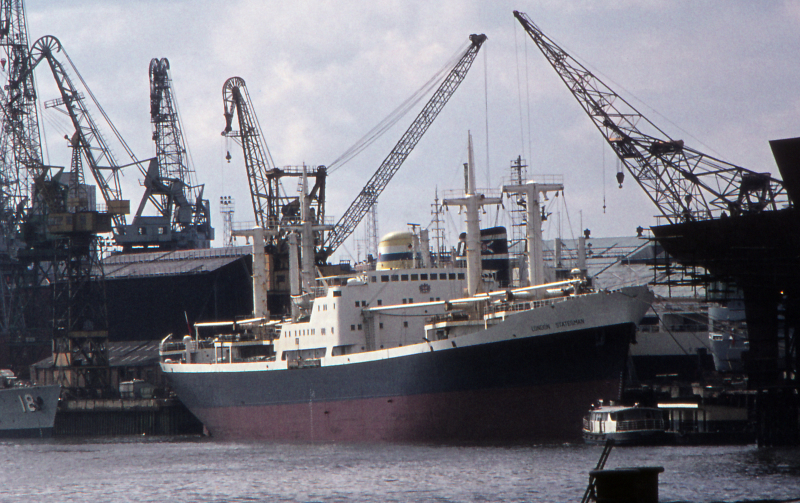 Note that the Mid Tyne Ferries pontoon, and ferry, as featured in the film "Get Carter", is under the ship's bow, and immediately below the stern of the supertanker on the stocks at Swan Hunters.